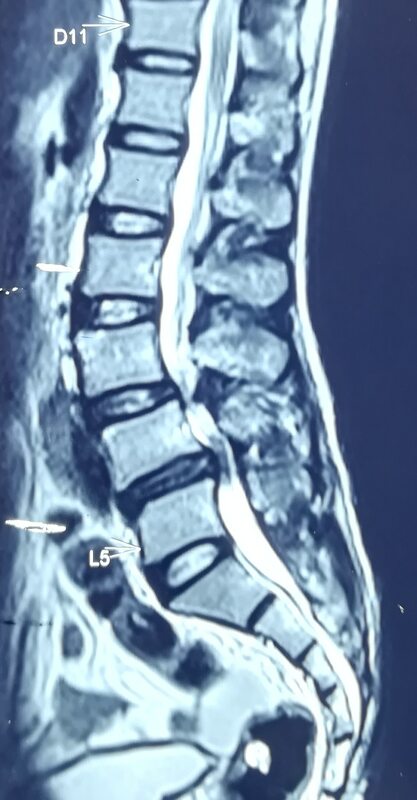 Home > Updates > Lumbar Canal stenosis with Degenerative SpondylolisthesisLumbar canal stenosis is a common cause of back and leg pain commonly seen in middle aged and elderly patients. It is caused by disc prolapse and bony over growth of facet joints resulting in decreases in canal diameter. Patient presents with back pain that radiates into the legs. pain increases with walking, standing and some times sitting and gets better with rest. the walking time and standing time gradually decreases over a period of few months. In some cases pain is accompanied by tightness, cramps, heaviness, tingling, numbness and weakness. These symptoms are called claudication in medical language. In cases with severe compression sometimes patient loses control over toilet activities and develops urinary incontinence. this is called Cauda equina syndrome and is a surgical emergency. A few patients of Lumbar canal stenosis have spondylolisthesis which is slippage of one vertebra over another. Treatment of Lumbar canal stenosis depends on severity of symptoms. Majority of patients do better with non operative measures like medications , physiotherapy. Majority of patients improve without surgery and only few cases need spine surgery. Lumbar Canal stenosis with Degenerative Spondylolisthesis Lumbar canal stenosis is a common cause of back and leg pain commonly seen in middle aged and elderly patients. It is caused by disc prolapse and bony over growth of facet joints resulting in decreases in canal diameter. Patient presents with back pain that radiates into the legs. pain increases with walking, standing and some times sitting and gets better with rest. the walking time and standing time gradually decreases over a period of few months. In some cases pain is accompanied by tightness, cramps, heaviness, tingling, numbness and weakness. These symptoms are called claudication in medical language. In cases with severe compression sometimes patient loses control over toilet activities and develops urinary incontinence. this is called Cauda equina syndrome and is a surgical emergency. A few patients of Lumbar canal stenosis have spondylolisthesis which is slippage of one vertebra over another. Treatment of Lumbar canal stenosis depends on severity of symptoms. Majority of patients do better with non operative measures like medications , physiotherapy. Majority of patients improve without surgery and only few cases need spine surgery.